One day after Iran and Turkey announced an agreement in the hopes of thwarting any international economic sanctions against Iran, U.S. Secretary of State Hillary Clinton announced a 10-page resolution with new sanctions had just been agreed to by the five permanent members of the U.N. Security Council (the U.S., Russia, U.K., France, and China), plus Germany. That’s the good news: the world’s major powers didn’t completely cave into the Iranian regime’s latest round of deception and trickery. The bad news: the world’s major powers have mostly caved. The resolution abandons any hope for the “crippling sanctions” President Obama and Secretary Clinton once vowed to impose. Instead, we’re about to see another round of lame, toothless sanctions even as Tehran continues building the Bomb, prepares to annihilate the U.S. and Israel, and prepares for the arrival of the Twelfth Imam and the end of the world. “[E]ven if the Security Council adopts the new sanctions, it is unclear whether the provisions — including a mandate to inspect Iranian ships suspected of entering international ports with nuclear-related technology or weapons — would inflict enough pain to force Iran to halt its uranium enrichment and cooperate with international inspectors. None of the previous three sets of sanctions passed by the Council during the Bush administration succeeded in their goal: forcing Iran to end its enrichment of uranium and to answer the many questions posed by international inspectors related to their suspicions about Iranian research into nuclear weapons. 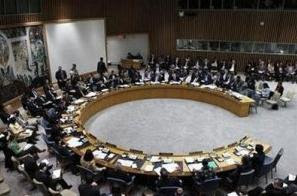 War is coming and once again the U.N. Security Council is doing precious little to stop it.